I was preparing to examine an article by Prof. Harold Bolitho when I stumbled upon this particular precious item which I thought would be an appropriate fit among the marginalia already included on this website. 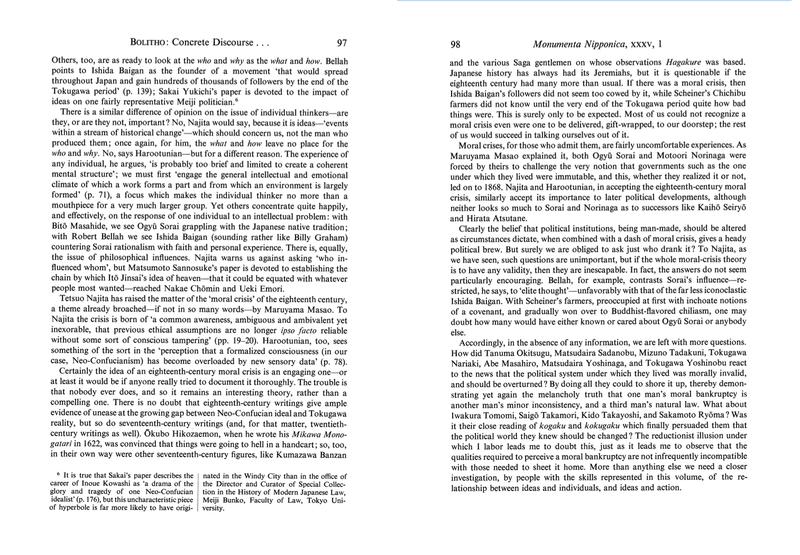 My discovery involves a 'dispute' between two giants in the field of Japanese Studies. 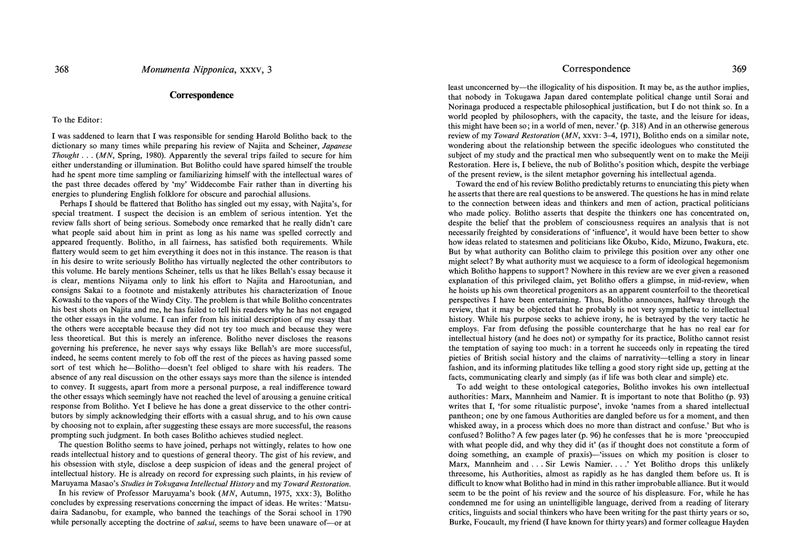 The conflict took place in the pages of Monumenta Nipponica, a journal published by Sophia University in Tokyo. 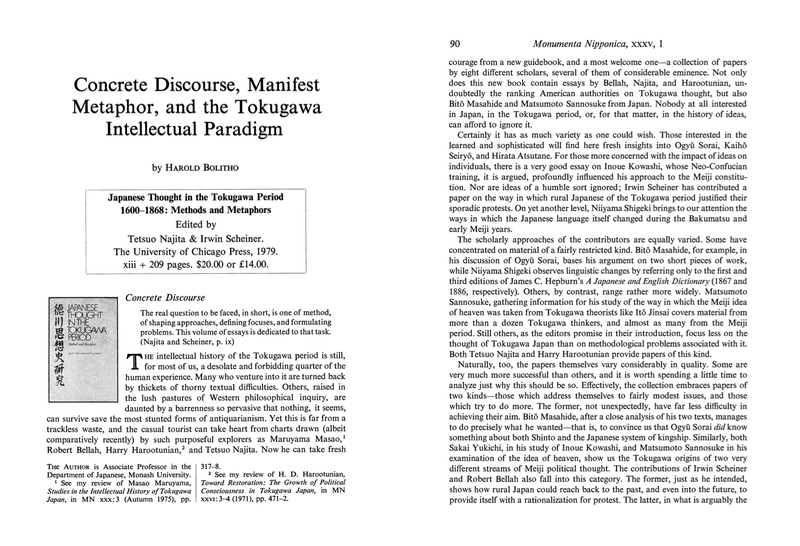 In the 1980 spring issue, Prof. Bolitho reviewed unfavourably the anthology of essays edited by Tetsuo Najita and Irwin Scheiner Japanese Thought in the Tokugawa Period 1600-1868: Methods and Metaphors and he singled out Prof. Harootunian's article as the most unsatisfactory of the bunch. Here's the original review. Professor Harootunian responded to Prof. Bolitho's criticism in the Autumn issue of the same publication. As the readers will see, the retort is heavily worded and it shows the author's clear irritation. 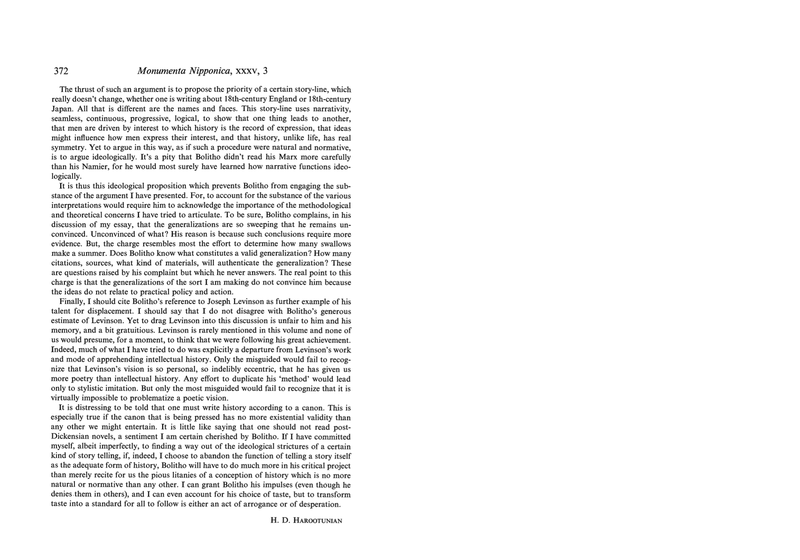 Finally, in the pages of the same issue, Prof. Bolitho was offered the opportunity of rebuttal. 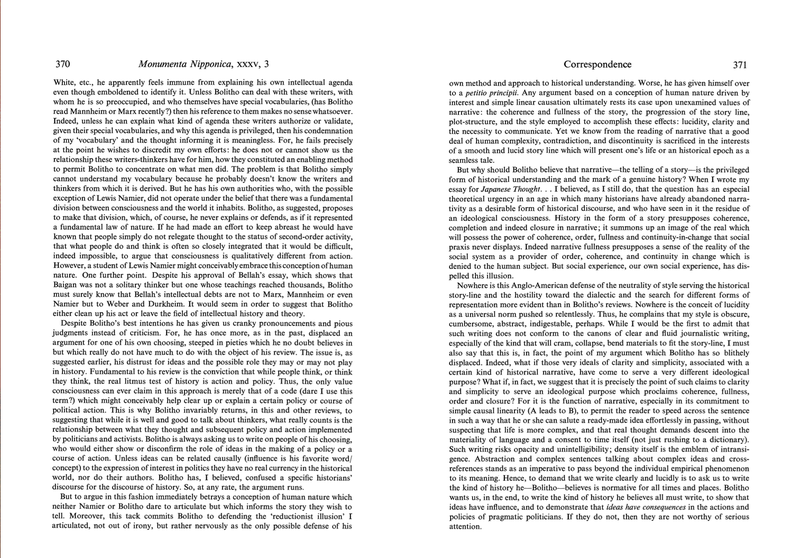 At first I thought that I'm witnessing a case of the old adversarial divide which haunts the Japanese Studies academia and which was instigated by the now decades-old contentious debate over the 'modernisation theory.' 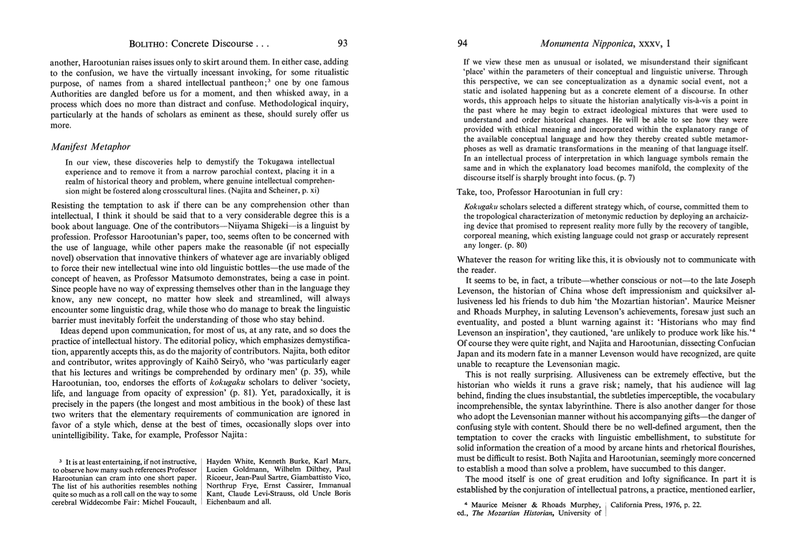 To summarise the issue, it suffices to say that the divide was initiated (and is being kept ongoing) by the separation between Marxist-based historical approach to the study of Japanese history (the kind conducted in the English-speaking world by E. H. Norman, John W. Dower and, according to the statements included above, Harold Bolitho) and the practitioners of non-Marxist scholarship (like Marius B. Jansen). A better overview of this debate can be found in this London Review of Books article. 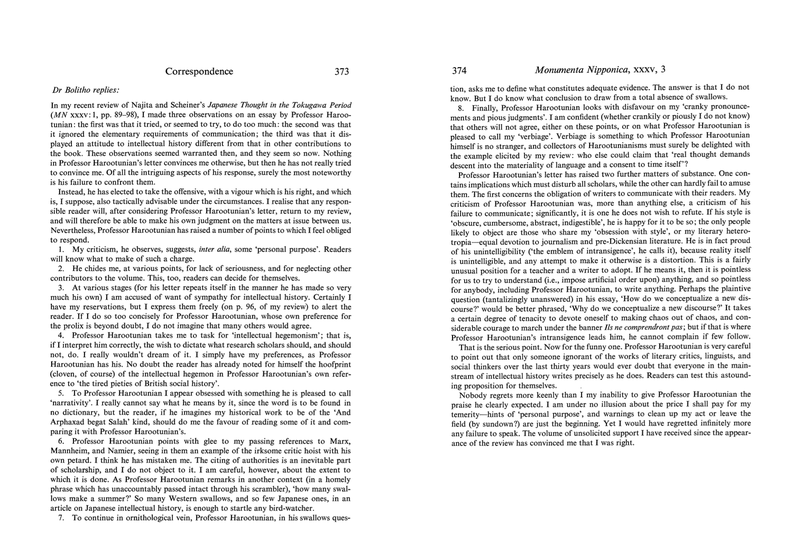 I was amused and somewhat pleased to discover that the dispute between Prof. Bolitho and Prof. Harootunian was sparked by a simple case of irremediable displeasure with a bad review. 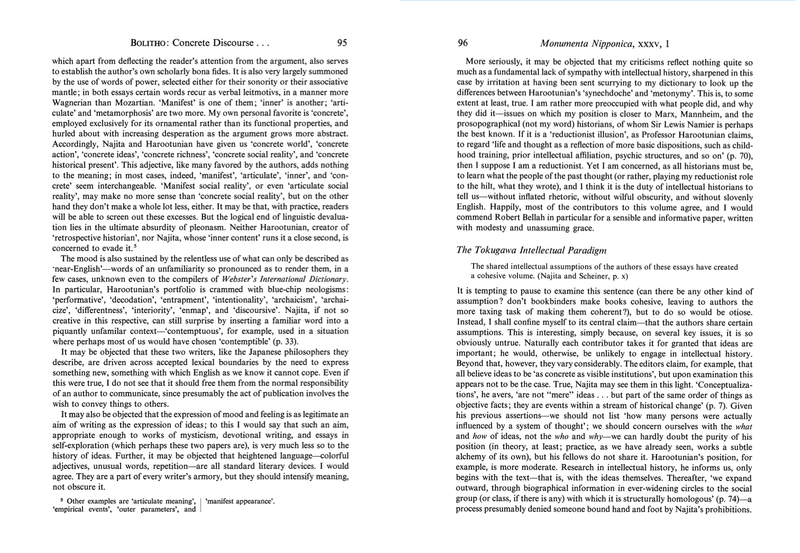 Here's how the 'correspondence' between the two scholars concluded. Bolitho, Harold. 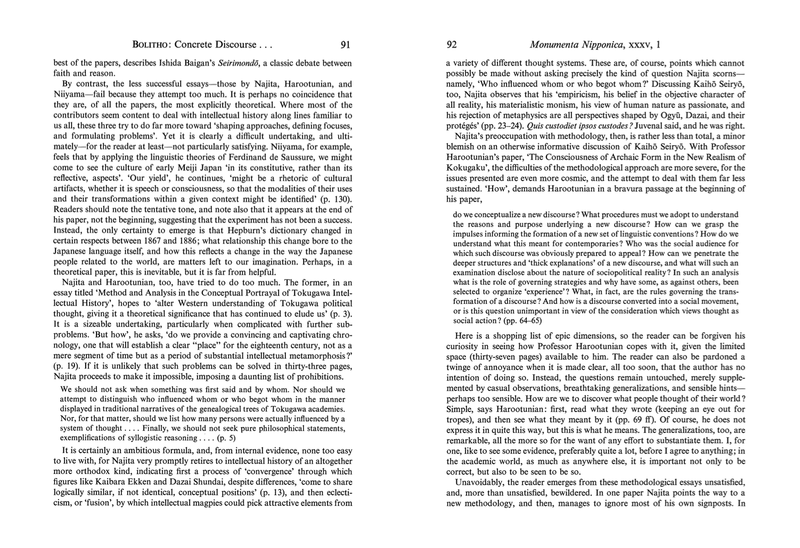 "Concrete discourse, manifest metaphor, and the Tokugawa intellectual paradigm." Monumenta Nipponica. Vol. 35, No. 1 (Spring, 1980): 89-98. Bolitho, Harold & Harootunian, H.D. "Correspondence." Monumenta Nipponica. Vol. 35, No. 3 (Autumn, 1980): 368-374.